Black Friday at the local mall was unusually calm this year. "All dead... all rotten. Elves and men and orcses. A great battle, long ago. The Dead Marshes... yes, that is their name." When a great battle, massacre, or terrible cataclysm occurs, the people involved may someday forget, but in some cases the land doesn't. Sometimes a place becomes contaminated, or possessed, by the misery that transpired there. Vegetation fails to grow, beasts and birds become sick or mad. The land is cursed, forbidden and dangerous. A Corpse Land is called this mostly because the bodies of the dead are ever present. No matter how many are buried, more seem to just appear, still bloody and disease-ridden, attracting scavengers that become puppets of the ghosts that haunt the place. In fantasy stories, Necromancers are drawn to such locations, and no matter how noble the armies involved may have been, they become twisted and malevolent, even attempting to re-enact their final moments with travelers who pass by. In reality, openly decomposing bodies are only disease vectors for a relatively short time — once animals and bugs have cleaned the bones and the tissue has been absorbed into the soil, all that carbon and minerals can actually promote plant growth. However, wars fought with modern technology — or magic — may leave a lot of stuff behind that's more dangerous than bodies, and the psychological associations of a place of mass death may keep people away better than any threat to their health. A hidden form of this may be a Field of Blades. See also Atop a Mountain of Corpses, Nothing but Skulls. It may overlap with Unholy Ground. Not to be confused with Giant Corpse World, a land made of a corpse. A town in the movie Ninja Scroll had this. It was a place that was littered with diseased corpses. An early story of the Berserk manga has Guts passing through the remains of an old battlefield with a priest and his daughter on pilgrimage and having to fight demon-possessed skeletons and other undead because of the Brand he bears. No. 6: The main characters have to climb a mountain of dead bodies. Any place with a sufficient concentration/accumulation of dead bodies in the New World of ''Overlord can become a nexus of necromantic energies, which cause the spontaneous creation of The Undead; weaker forms appear at first, but if some sort of necromantic critical mass can be reached it can cause a chain reaction where ever greater numbers of undead of ever stronger varieties appear until a run-of-the-mill Zombie Apocalypse will seem mild in comparison. This is why cemeteries in large cities such as E-Rantel are walled off and guarded and the weak undead that periodically appear are routinely culled, and why the Katze Plains, where the Re-Estize Kingdom and Baharuth Empire have their annual war/battle, is uninhabited despite ostensibly being in a strategically advantageous geographical location. Polish graphic novel "Żyjesz" ("Alive?") turns the island of Poveglia into this. Judge Dredd: The Alternate Dimension known as Deadworld is one giant graveyard, having once been the homeworld of four now-undead Dark Judges who reasoned that life itself was a crime. In Watchmen the remains of New York is littered with corpses after Ozymandias goes through with his plan. Jason's dreamscape from Freddy vs. Jason, as it's filled with the bodies of all his victims. Cybertron in Michael Bay's Transformers is depicted as this while Optimus narrates the history of the Great War to Sam and Mikaela. The only thing moving is a lone Autobot limping to safety... before being impaled by Megatron's spear. In 9, the bodies of those killed by the poisonous gas still lie where they fell, desiccated yet undecayed, as the toxin was so potent that even the bacteria didn't survive. Aokigahara Forest in The Forest (2016). It's a very beautiful forest, however, it's filled top to bottom with the restless dead forms of people who died there (IRL, it's a popular place to commit suicide in Japan). The Dead Marshes in The Lord of the Rings, a foul bog stretching miles across Middle Earth filled with corpses from the first war with Sauron. Spirits of the men, elves, and orcs that were buried there try to lure travelers into the marshes to add to the body count. Tolkien scholars speculate that the terrain was inspired by the author's experiences in the waterlogged trenches of World War I. The Silmarillion, on the other hand, has a curious subversion: the Hill of the Slain, a gigantic pile of the bodies of the elves and men who were killed in the battle of Nirnaeth Arnoediad, where Morgoth managed to utterly crush his enemies and ensured his eventual takeover of the whole of Beleriand. While the surrounding plains were reduced to a poison-choked wasteland, the hill itself became the only verdant place for miles. The Belgariad includes the horrible realization by Garion that the strangely shaped mounds of moss in the Arendish forest are corpses from their centuries-long blood feuds. 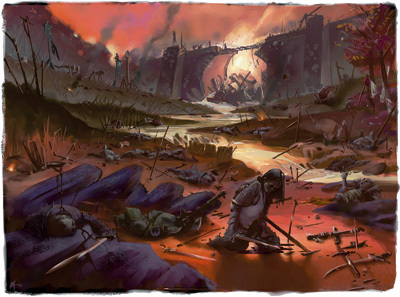 In the Warhammer short story "The Ignorant Armies", the protagonist's journey after his brother and the villain who took him takes him to an area covered by skeletons old and new. He learns that every night, the place becomes a battlefield between various Chaos warriors who must survive there for a month in order to become proper champions for their cause. The TARDIS: My sisters are all dead, and we're looking at their corpses. A lot of Civil War battlefields along the Mason-Dixon line in Deadlands are like this, especially Gettysburg. What makes them even worse is that the piles of heaped bodies can experience Demonic Possession and become unique Undead called "Gloms" — which are, as you might expect, heaps of animated corpses fused together by a single animating Manitou, which keep growing bigger and bigger as they absorb more corpses into their mass. The "Battle of Bones" area in Forgotten Realms, named after an event that changed it forever. Due to drought and the expanding Anauroch desert, a lot of goblinoids (more than a quarter million combatants) had to migrate, humans and allies (more than half of that) were determined to stop them in a convenient pass and much slaughter ensued. The Mournland from Eberron, which used to be the nation of Cyre until it was destroyed by a magical disaster called the Day of Mourning. Exalted has the shadowlands, which are created whenever there's a massive act of slaughter in a concentrated area. They're half-open gates to the Underworld that open all the way when night falls, and are often populated by hungry ghosts and zombies. The Underworld itself is a Corpse Land in a very literal sense, as it's the perpetually decaying bodies of the creators of the world. In Magic: The Gathering the plane of Grixis is inhabited by dead things, undead things, demons, and the occasional desperate necromancer. Due to a lack of green or white mana it's incapable of producing new life. Grixis land art in particular tends to be covered in skulls. Black-aligned lands usually have this theme. At the center of Ulthuan's inland sea is the Isle of the Dead, the nexus of a great spell woven by ancient High Elf mages to bend the Winds of Magic into their current configuration, and where the Sword of Khaine is kept. As a result of this localized Time Crash, the island is covered with the corpses of elves who fell during the ancient war against Chaos, their millennia-old bodies just as bloody as the day they fell. Nehekhara (Ancient Egypt) is dotted with the tombs of the kings of Khemri, who were buried with their servants to rule the after life. Unfortunately, the rituals went wrong, and they returned as skeletons. Now there's a single country with a few dozen legitimate rulers, each technically correct when they say they're the rightful king. A game mechanic in Warcraft III; Undead structures can only be built on Blight, ashen, bone-studded terrain generated by their Ziggurats or headquarters building. The corpse are continuously generated by graveyards, though only up to five at a time. In the World of Warcraft, Deadwind Pass is a stretch of gray, barren mountains inhabited solely by giant spiders, vultures, and an ogre tribe. Everything else is either dead or left long ago. In Northrend, the Dragonblight is an ancient dragon graveyard littered with the skeletons of wyrms and other creatures. Icecrown Citadel appears to be a glacier at first, but on closer examination you can find corpses frozen in the ice, including Frost Wyrms being excavated by Scourge forces. In Outland, Hellfire Peninsula is a shattered, dusty battlefield whose wildlife is universally violent, predatory and often demonically possessed. Flames erupt from hellish chasms, undead soldiers roam the ruins of their fortresses, the only water available is from swamps of mutated poison slimes, and one of the major local landmarks is the Path of Glory, a road the Horde made from the bones of slain Draenei. The Bone Wastes of Terokkar Forest are covered with the remains of Draenei once entombed in Auchindoun. In Halo, this is often the fate of a planet that gets glassed by the Covenant; in Halo: Reach, we can see this process happen live as the Covenant glass New Alexandria. Post-war, the people who work to restore glassed worlds often feel unnerved by the fact that the "glass" they're clearing is partly made up of people killed during the glassing. Left 4 Dead had areas where bodies where stacked in piles or covered with sheets. Other places had barricades that have been overrun. Pools of the Ancient Dead in MediEvil is a barren, swampy area where the dead from a long ago battle still roam. An ASCII-based form of this graced the exterior of the infamous Boatmurdered after its residents resorted to magma-cannoning all their troubles away, since no one bothered to clean up the remains. Fanart tends to go a little overboard, depicting a massive wasteland of trashed goblin equipment and elephant bones. The Witcher 2: Assassins of Kings has some, complete with skeletons and evil spirits. The Gears Of War series has Char "The Ultimate Sin of the COG", the area where the Hammer of Dawn was used on the Locust to halt their attacks, roughly 75% of Sera. In a disturbing mirror of Pompeii, there are ashen remains of every man, woman and child who were unable to reach the safe zone. Dead Space uses this as its primary setting, aboard the Ishimura. While an artificial environment, a good bit of the ship seems to have "gone wrong," with most of the safeguards on dangerous areas disabled and the whole ship being a great deal more of a death trap than usual. Also, you know, the roving horde of mutant space zombies that now call the place home. Dead Space 2 manages to both display this trope and imply it. Titan Station is in pretty much the same shape as the Ishimura from the first game. The Ishimura herself appears about 2/3 of the way through the game, but this time is most of the way through a sanitation process. The swathes of blood and gore have been neatly cleaned up, or hidden behind tarps neatly taped to the walls. An NPC even explicitly states that Isaac knows what's beneath all those tarps, invoking this trope implicitly. In NetHack, the Valley of the Dead is strewn with corpses of "previous" adventurers the first time the player arrives there. Crysis 2 involves a deadly alien disease that is ravaging New York City. In the game the player is constantly walking past quarantine zones filled with grotesque corpses. In Mass Effect 3, when Shepard goes onto the Reaper-hijacked Citadel, s/he ends up in a long hallway piled with corpses on either side. The end result of Darkspawn assaults in Dragon Age: Origins are barren wastelands called "Blightlands" that can take centuries to recover. Corpses left in these regions won't even rot as all insects and even bacteria are already dead. In Path of Exile, the entire continent of Wraeclast is essentially this. Zombies endlessly roam the coastline and one of the characters even remarks that nothing stays dead for long in Wraeclast. Muramasa: The Demon Blade has an example in Kisuke's sixth dungeon; "Kawanaka Island, the Ancient Battlefield of Hachimanbara", a former warzone where the soldiers who once fought there continue to do so even in undeath. The whole place is choked with such evil and general negativity from its bloody history that normal people who find their way here will be driven insane by the atmosphere alone; literally the only kind of humans who can even enter this land without any ill effect are Masters of the Oboro swordfighting style(which both playable characters Kisuke and Momohime/Jinkuro conveniently are). Dunwall in Dishonored is currently in the midst of a plague born by swarms of large angry rats. Despite the quarantine efforts, the death count is considerable. The bodies of the dead are collected, taken by train to the abandoned and flooded Financial District, and unceremoniously dumped off the raised tracks, forming an enormous pile that the waters float corpses down throughout the rest of the district. Mount Todd Forest in Wick is a forest haunted by no less than seven ghosts, the remains of a family who died under mysterious circumstances. The emponymous game "Wick" involves locking some poor sod in at midnight with a single candle and a book of matches and seeing if they make it to 6:00. Most players end up dying. The Rotten Vale in Monster Hunter: World consists partially of massive rotting skeletons and partially of rock caves lined with smaller corpses. It is also eventually revealed to be where Elder Dragons go to die. A robotic variation: The Eichenwalde and Black Forest maps in Overwatch are littered with dead, occasionally dismembered Bastion-model omnics, the same kind as one of the playable characters, twenty-something years after the battle between humans and omnics depicted in the Honor and Glory cinematic. The Permian extinction (the world's largest mass extinction, more devastating that even that of the dinosaurs) saw a rise in fungal species, adapted to conssume corpses. It may very well have meant that animal and plant corpses littered the world for a while. The island of Poveglia in Venice harbor was used as a leper colony/plague pit from 1793 to 1814 and again from sometime in the early 1900's to 1922. A major portion of the islands mass is now dead human bodies. Fishermen avoid it for valid fear of getting corpses caught in their nets. British casualties from the 1814 Battle of New Orleans were simply buried in the very damp area where they fell. During Hurricane Katrina, some skeletons surfaced as the ground washed away. St. Petersburg, Russia is known as "the city built on bones". Its oldest parts were built by forced labor during Peter the Great's time, and many peasants press-ganged into the workforce died there. Because of that, St.Pete still enjoys a somewhat gothic and sinister reputation in Russia. It became Corpse Land again during World War II, after a long siege by the Nazis (Soviet losses were at about 1.5 million). Some parts of them are still unfit for human habitation, such as the Zone Rouge — note that while the corpses themselves would be reduced to bones by now, what really renders the land uninhabitable is the huge concentration of unexploded ordinance and the fact that the soil is poisoned with heavy metals and, well, poison. A naval version of this exists in the Savo Sound in the Solomon Islands, known as Ironbottom Sound as a result of the numerous ships lost in the fierce fighting between the Japanese and the Allies during world war two. The wrecks of fifty ships are scattered across the area, ranging in size from patrol boats to the Japanese battleship Kirishima. Aokigahara forest at the base of Mt. Fuji in Japan is one of the country's largest suicide spots. There's even a gate on it with the number of Japan's version of the Suicide Hotline, and forest wardens often have to oust campers who are on the fence about going through with it. The forest is strung with survey tape, which people bring along as a lifeline in case they change their minds.